Or "Danza Ritual del Fuego" (Ritual Firedance) from "El Amor Brujo"
"Everyone knows that I am from Texas and have associated steel guitar and western swing as one in the same. Classic country just isn't classic country without a steel guitar. I am not saying that there is anything wrong with that because I once thought that that was what steel guitar was all about. 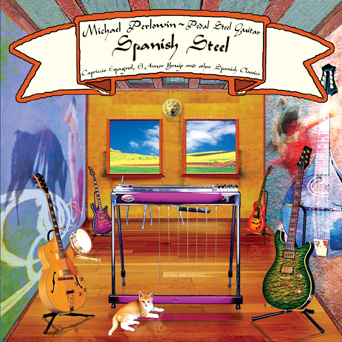 Well, enter Mike Perlowin and his new CD "Spanish Steel". Who would have ever thought that steel guitar belongs in spanish music? Not me until now. He makes us know that steel guitar has no limits. It takes some getting used to but his new CD is a great production of talent very few folks have.Taking some 2 to 3 years to complete, I think it opens a whole new world that most of us will not attempt to follow. Who in the world in TEXAS would drive down the street with Spanish Steel playing rather than Bob Wills? I for one will and not feel one bit bad. "...an absorbing, innovative and rewarding suite of music, invested with considerable intelligence and a quite "different" take on what music-making is all about. Any jazz enthusiast who is attuned to the music of artists like Bela Fleck, Pat Metheny and Bill Frisell will find a lot to enjoy and admire here, and I have no hesitation in recommending it to any music-lover with functioning ears who wants to hear something that little bit out of the rut." "What Mike did is absolutely brilliant. He has explored the instrument we know and love with all its possible textures, and woven it together into a cohesive whole. And when I listen to it, Im not thinking, Gad! Its West Side Story being played on steel. I simply play it a lot because I enjoy listening to it." Winnie Winston, author: Pedal Steel Guitar, Oak publications. BUY CD from Steel Guitar Music! "Everyone who plays classical music should be required to listen to this recording. 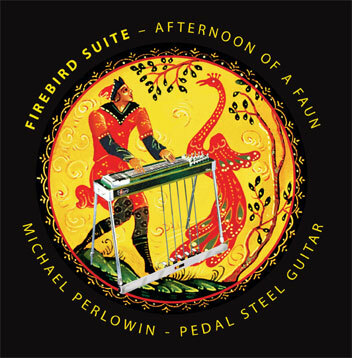 Mike Perlowin is a musical genius who I am proud to know and learn from, and honored to have for a friend. I love this instrument, and this music and the beauty of these sounds delights my soul." Mark Laycock, Music Director: Orchestra London, The Princeton Chamber Symphony: Guest Conductor: The Philadelphia Orchestra, Philharmonia Orchestra, Indianapolis Symphony.